Δελτίου τύπου: «All-Female Four Piece Band Exit Eden Announces Debut Album "Rhapsodies in Black"! Four musicians from four different countries with four entirely different biographies, yet all stemming from the world of Rock, now united in one band: EXIT EDEN! The all-female four piece ensemble unites all attributes ascribed to the new millennium: cosmopolitan, self-confident-independent and ready to do their very own thing! Despite their diversity, the four singers Amanda Somerville, Clémentine Delauney, Marina La Torraca and Anna Brunner blend together personally as superbly as they do vocally with their very diverse vocal tones and techniques that go from opera style to raspy rock! 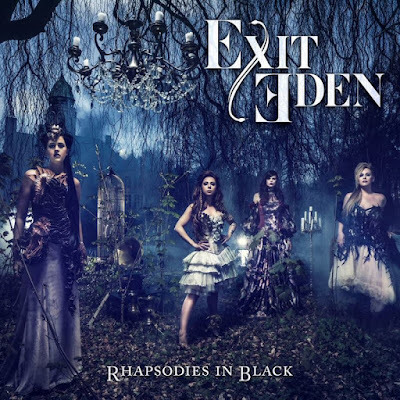 This constellation created extraordinary and powerful ideas and finally became their unique plan to raise EXIT EDEN’s very own edge: to show the world that almost every classic song can be transformed into a solid metal-rock song.